Here at the Makers Lab, we’re always excited to see how we can apply 3D printing and related technologies to the various health science projects coming into the space. Last November, we’ve shared with you the process of working with UCSF Archives and Special Collections to recreate medical artifacts. This month, we’ll share with you our latest project involving a special piece of UCSF history: recreating the Gold-Headed Cane. This was a project that I started working on with Linda Tsiu of the School of Medicine Dean’s Office for the UCSF Gold-Headed Cane Society, though Linda has brought this project to the Makers Lab’s attention since Fall 2016. Have you wondered how it was done? Keep reading to find out! Each year, the Gold-Headed Cane is awarded to one of three UCSF medical students nominated by their classmates and faculty that exemplify the qualities of a true physician. 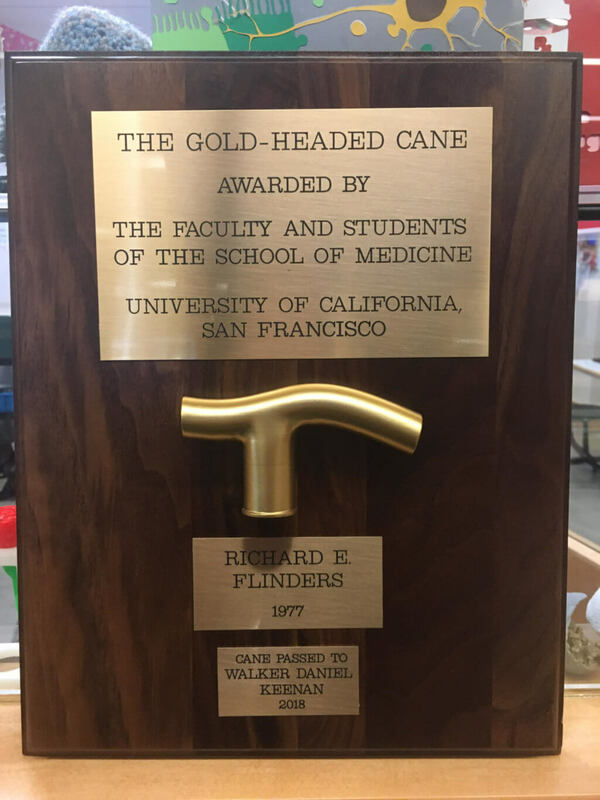 Since the Gold-Headed Cane Society’s launch in 1939, the cane has traditionally been a legacy award at UCSF—meant to be kept for the duration of the recipient’s practice before being passed down to the next generation of physicians, usually when the recipient retires from the medical profession. The presentation of each year’s award relies heavily on the passing of canes from previous recipients. In place of the cane bequeathed, the donator receives a plaque with a cane handle to keep. There are only two remaining versions of the Gold-Headed Cane located at UCSF. The original cane from the 1950s is situated in the UCSF Archives vault, while the other cane, from the 1980s, resides in the School of Medicine Dean’s Office. The 1950s cane in particular requires delicate handling with gloves. Though it is hoped that a prior recipient will bestow their cane to a new generation of graduates each year, due to a number of varying factors this may not always be the case. This was the problem that we were aiming to address using 3D printing in the Makers Lab. 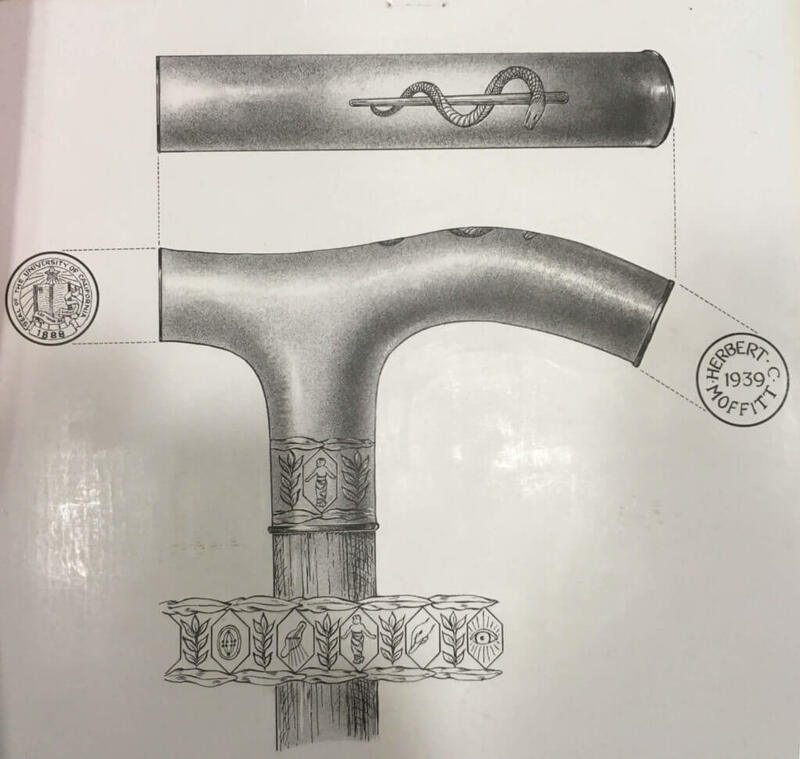 Kelsi Evans and David Uhlich from Archives were able to provide me with not only a primer on the history of the Gold-Headed Cane tradition, but also with magnificently detailed blueprints of the original cane design. Taking the blueprints provided, I took measurements of the cane handle and decided to use the 1980s cane as a point of reference for 3D modeling. Prior to taking the 3D modeling route, recreating the cane had posed a challenge for other methods. 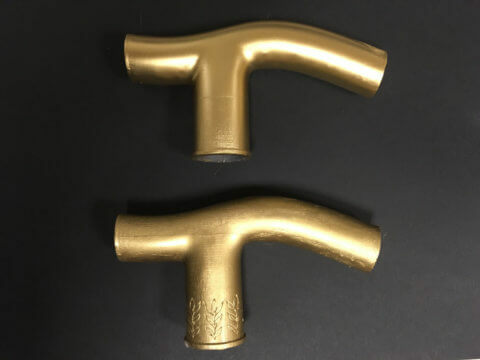 The reflective gold surface of the cane was difficult for 3D scanning lasers to pick up, and the engravings on the cane were unable to be reproduced accurately using modeling clay. 3D modeling from scratch would ensure the most flexibility with the design, much more than editing an existing model. As the design of the Gold-Headed Cane is elaborate and contains contours, 3D modeling the cane required the use of a more advanced CAD software than the Makers Lab favorite Tinkercad, which works better with basic shape geometries. Fusion 360, a versatile program capable of creating complex shapes using both freeform and parametric modeling, became my tool of choice for the next steps. 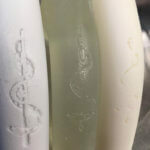 After modeling up the cane shape, I worked on adding in the engravings. There were are no existing files for the engravings on the cane, so I ended up vectorizing the images found in the Archive blueprints using Adobe Illustrator. 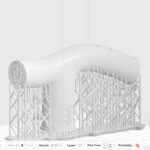 I worked closely with Linda Tsiu during all steps of the modeling process to verify the design. This iteration of the cane model was still relatively geometric at this point. 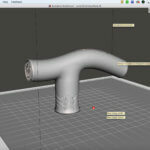 I utilized Meshmixer, a post-processing software for 3D models, to finalize the form of our 3D modeled handle. I spent the majority of my time in this stage sculpting areas of the cane and adjusting the thickness of these areas in Fusion 360 to be as accurate as possible, without sacrificing printability. 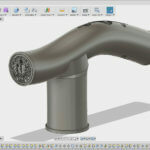 This was perhaps the trickiest part— when designing in 3D planes, technically anything can be possible, but it is only after dropping the design into a slicing software like Cura, that you are able to see if the model is printable according to machine tolerances. I initially had been printing my prototypes using the Ultimaker 2+ printer. Although it prints at a considerably higher resolution than most FDM printers, the printer was unable to capture all the details of the engravings. After each prototype cane handle was printed, I sent them to the jeweler that would be fitting the cane onto the plaque for approval. I then transferred my print to the Form 2 SLA printer. Once I experimented a little more with the materials, I found that the the resin material provided the highest quality print. Taking the finalized design, I sent it into PreForm to check printability. I printed the final cane using white resin. All that was left was to smooth out the model to provide a nice, smooth base for painting. Finishing techniques I used included wet sanding and the use of a dremel tool to remove the supporting structure marks on the model. The jeweler added additional smoothness using sandblasting before coats of Krylon gold leaf spray paint were applied. 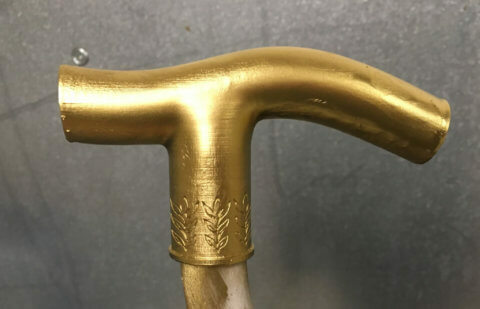 The first ever 3D printed Gold-Headed cane was awarded to the physician who bequeathed his cane for 2018. It was extremely rewarding to see the final product mounted onto the plaque, and even more rewarding to hear that the Gold-Headed Cane society will be adopting the use of 3D printed canes for future cane donators. I spent a total of six months, on-and-off, on this project. 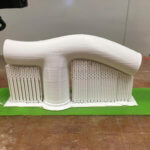 By 3D printing and modeling, it enabled me to create fast iterations and oftentimes provide same-day turnarounds for any changes that needed to be made. This would not have been possible using traditional manufacturing or casting methods, and would be an extremely costly and even more time-intensive process considering the level of experimentation involved. It has definitely been a long journey but I am grateful for the opportunity to have been able to partake in such a project and to have been able to learn a lot more about 3D modeling workflows along the way! As we continue on working with Archives & Special Collections, the Gold Headed Cane Society, and many other organizations that preserve history on UCSF’s campus, we are aiming to support the creation of tangible pieces of history that will no longer need to be kept behind a glass case, but instead brought into the hands of the UCSF community. Many thanks to Kelsi Evans, David Uhlich, and the Archives team for providing insight and reference materials and Linda Tsiu for supporting and facilitating communications with the jeweler. Also, a huge congratulations to Walker Keenan, the 2018 recipient for the Gold-Headed Cane. Have a project in mind? Visit the Makers Lab website to get started. 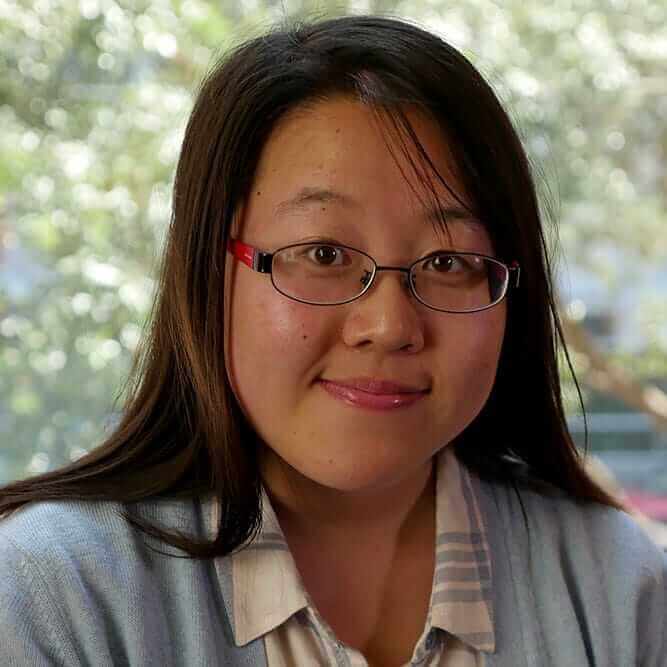 Jenny Tai is the Makers Lab Technician at the UCSF Library. Contact Jenny with questions about the Makers Lab, 3D printing technologies, and designing and acquiring 3D models.